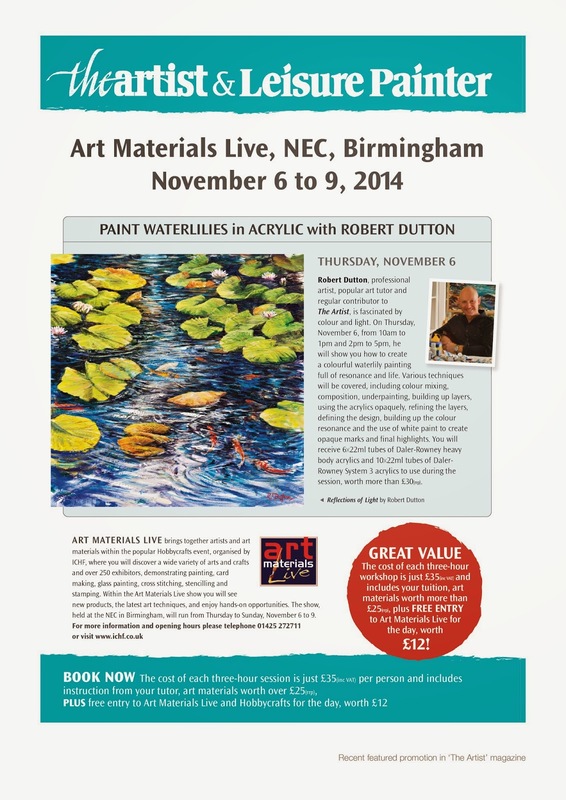 ‘Waterlilies workshop’ with Robert Dutton sponsored by ‘The Artist’ magazine. 2 exciting acrylic painting workshops 10am to 1pm or 2pm to 5pm. A superb and unique opportunity awaits you to learn the latest techniques with acrylics in a choice of 2 exciting workshops with me at the ‘Art Materials Live’ show at Birmingham NEC. Learn how to create a colourful waterlily painting quickly and easily in simple to follow stages, creating a colourful dynamic painting full colour and expression. you will learn techniques from me for clean colour mixing, composition, underpainting, layering and so much more! The cost of each three-hour workshop is just £35(inc VAT) and includes your tuition, art materials worth more than £25(rrp), plus FREE ENTRY to Art Materials Live for the day, worth £12! You will receive 6 x 22ml tubes of Daler-Rowney heavy body acrylics and 10 x 22ml tubes of Daler-Rowney System 3 acrylics to use during the sessions. All easy to follow reference will be provided by me. Great value indeed and not to be missed! After the workshop (or before) you have free entry to this fantastic arts event and there is lots to see!